This project is the complete replacement of the Sisson Street Bridge over the CSX Tracks. The project will utilize a complete closure of the Sisson Street between 24th Street and 26th Street and is expected to take approximately 18 months. Because of CSX’s desire to eventually “double-stack” their rail cargo in the future, the elevation of the new bridge will be approximately 3 ft. higher than the existing bridge. The new geometry will require reconstruction of both approach roadways on the north and south side of the structure. 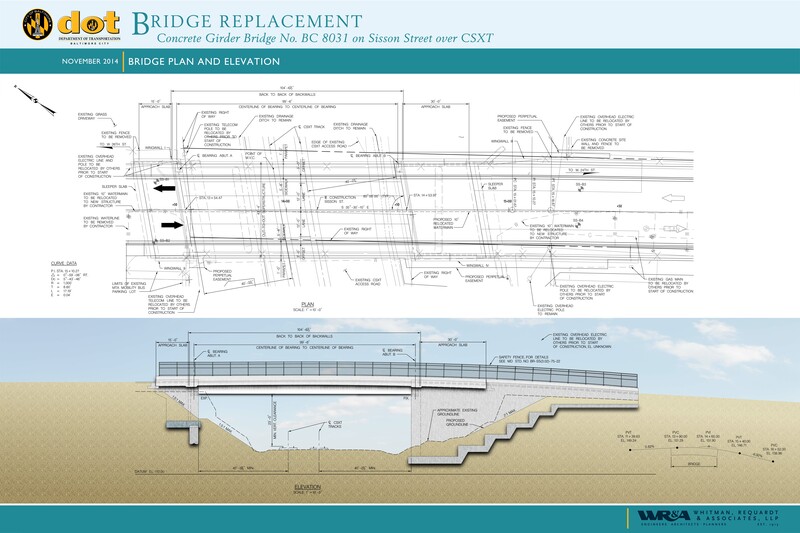 The new bridge will carry one-lane of traffic in each direction using a 12 ft. wide vehicular lane; a 3 ft. offset will also be in place between the driving lane and the 5 ft. wide ADA compliant sidewalk. The water main currently located on the west side of the structure will be relocated underneath new bridge. Baltimore City DOT anticipate construction to start at end of 2019.